At Lloyd Pest Control Services Ltd., our goal is simple. We strive to exceed expectations and achieve success with our wildlife solutions advantage. Unlike most of our competitors, our employees have taken specialized training resulting in being granted the designation of registered licensed furbearer trappers in the province of Ontario under the Fish & Wildlife Conservation Act (MNR). Lloyd Pest Control Services Ltd. has for over 30 years developed and used successful, efficient, safe and reliable live trap and release/relocation programs for the control of nuisance wildlife, and in addition, our unique license permits us to offer permanent solutions to the protection of your property via lethal traps or off-site procedure. So to be, or not to be … to relocate or to dispatch, that is the question. The Ontario Ministry of Natural Resources (MNR) mandates trapped animals are to be released no further than 1km from their point of capture. Find new food sources in unfamiliar territory. Find a new home (preferably not your neighbour’s). Survive increased competition for food, as most new habitats can already have high occupancy rates. Fight new enemies and minimize traumatic injury, while simultaneously avoiding death through possible exposure and starvation. Meet strict relocation guidelines that undoubtedly contribute to repeat visits to the original capture site and can increase frustration for all concerned. So yes, relocation can/does have unintended consequences. The decision to use lethal traps can be expedient and efficient. Although euthanasia by definition is considered to be a “gentle/good death,” we recognize that it too is considered a painful decision for many. Given all the facts, together we will develop a wildlife removal solution that reflects a successful objective, i.e. exceeding your expectations and meeting with your approval. Lastly, our licensed technicians are skilled in structural damage assessment and repairs to your home due to the presence of wildlife. We would be more than happy to prepare a repair estimate for your consideration and approval. Contact us to learn more! Up to 10 days of on-site service, as determined by our technician to remedy the problem and attain success. 1. Our fee covers the initial inspection, trap placement, trap repositioning/baiting, temporary structural repair (if applicable) and animal relocation/dispatch as required. The technicians involved each day will be prepared to relocate animals and make decisions in order to resolve wildlife problems in a timely manner. Wildlife situations are all different and some come under control in a few days, while others can take longer. Our hours of operation vary throughout the year. From May to September only, we are available on Saturdays. We are not available statutory holidays or Sundays to relocate wildlife. If we are not working the Saturday, then we will either remove the trap sometime on a Friday or we may leave it and wire it open to encourage feeding over this period. The trap will either be returned on the Monday or the wire will be released to again begin trapping. 2. If the animal has caused entry damage to your home, our technician will assess this at the time of inspection, and we will offer a price for your consideration and approval if the job is within our capability. Once the price is known by you if we have not received approval and the traps are pulled, we will consider non-approval/non-contact to indicate our repair services are not wanted and our business will be concluded. 3. A technician will be on-site at some point each day to check, re-bait and/or relocate animals as required. If you see an animal in the trap, a call to our office is appreciated. 4. At some point during the trapping process, a temporary patch will be used to cover the damaged area (if not too extensive). This is done so that we can determine if in fact all offending animals using this space have been relocated. If the temporary proofing has been moved, it may indicate the need to continue trapping. A homeowner is an invaluable source of information. Calling in to report what you see and hear during the trapping period is helpful. 5. Where possible, enlisting the help of other family members and maybe even neighbours to keep an eye on the trap and calling us immediately when an animal is in the trap will ensure a pick-up and reset as quickly as possible. 6. We will do everything within our expertise to ensure success. We are however dealing with wildlife, which is unpredictable. Our efforts and past experience carry a high success rate, but on occasion further intervention is warranted and charges will apply. Lloyd Pest Control Services Ltd. provides safe, reliable live trap and release/relocation programs for many forms of wildlife. For your convenience, we’ve gathered some basic information so you can better familiarize yourself with these forms of wildlife, including their characteristics, the damages they can potentially cause and the most effective methods to deal with them. The beaver is a semi-aquatic mammal and the largest native North American rodent. Mature beaver males weigh about 19 to 25kg (40-60lbs. ), but can weigh over 40kg (100lbs.) Only one litter of 4-6 kits is produced each year from April to June, following a 100 to 105-day gestation. At 2 years of age, beavers leave the home colony to search for winter quarters, which may take them up to 10km away. The average lifespan of a beaver is 5-10 years, with some living up to 20 years. Because of their size, behaviour and habitat, beavers have few enemies. Mortality is usually the highest during the first year, as coyotes, wolves, bears and other large carnivores are their main predators. Now that the fur trade has declined, beavers are beginning to increase their numbers again. As they reclaim their former range, potential conflicts between people and beavers are also expected to increase. Before beginning any beaver control action, Lloyd Pest Control Services Ltd. will assess your beaver problem fairly and objectively. Are beavers really causing damage or creating hardship requiring control action? The very presence of beavers is often seen as a problem when, in fact, the beavers are causing no harm. You should also determine the type of damage or problem the animals are causing and then match the most appropriate and cost-effective controls to the situation. In human-managed landscapes, beavers can create several problems. The most common problem associated with beavers is the plugging of road culverts, which causes the water to rise on one side of the road, flooding the road and potentially undermining the road bed. Culverts are easy to plug and difficult to unplug, resulting in continuous and expensive road maintenance costs. The rising waters behind a beaver dam or a plugged culvert also results in land being flooded. Depending on the topography and the surrounding land uses, this problem may become quite serious. Finally, beavers are frequently implicated in the loss of trees around the edges of their ponds. In some cases, these trees may be special landscape trees or valuable orchard trees. 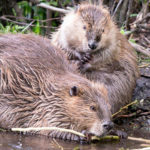 Once the decision has been made to control beaver damage, we have only a few options – live trap and relocate the problem beaver or destroy the problem beaver and have the dam removed. Research has shown that relocation is of questionable value, as return is sometimes possible and survival rates are low when trying to establish a new habitat before weather conditions intervene and/or food supplies are in short supply. Lethal trapping is an action that can be considered humane after carefully considering the other options. Beaver devices that alter damming behavior can be deployed with some success and permits may or may not be required before installation. To learn more about your options or to schedule a consultation, please contact us! Capable of speeds averaging 30 miles per hour, coyotes stand 1½ to 2 feet tall and on average weigh 20-30 pounds. Coyotes are usually gray, reddish-brown or pale gray in colour, with their colouration varying by area. 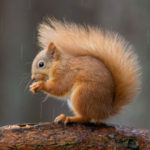 They are known for their bushy, black-tipped tails and for having a variety of food sources, including rabbits, voles, shrews, mice and any other small to medium-sized animals including cats and dogs. 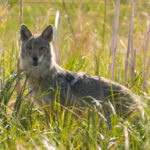 Another easily recognizable trait of coyotes is their distinctive howl, which is used to locate others, establish territories and challenge dominance. Coyotes pair for life and typically begin to mate between January and March. Up to 12 pups are born between April and May. Coyotes usually leave the den at 8-12 weeks, and by fall, they are forced out of their parents’ home range. If coyotes have become a problem on your property, Lloyd Pest Control Services Ltd. can deploy specialized trapping methods. Give our expert wildlife team a call. We are at your service! As opportunistic omnivores, opossums have a very diverse diet consisting of anything from insects, fruit and small animals to grains and eggs. This flexible diet and an equally flexible reproductive strategy allowed them to be successful colonizers and survivors in unsettled times. Thanks to more plentiful, man-made sources of fresh water, increased shelter due to urban encroachment and milder winters, they have successfully migrated northwards, including Ontario and even farther north than Toronto. Opossums are usually nomadic, only staying in an area as long as there is an adequate supply of food and water easily available. They do not dig or put much effort into building their own burrows as long as they can find temporary ones to occupy. Dark, secure areas are preferred, whether they’re above or below-ground. Opossums do not generally present a great nuisance to humans. Usually, they’re found inadvertently within our traps when we’re trying to trap a non-target animal. 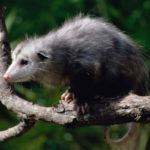 On occasion, homeowners will enlist our help if they’re uncomfortable with the presence of an opossum on their property or if they fear their pets are in harm’s way. Call our office with any questions or concerns you may have about opossums on your property! Raccoons are omnivorous, consuming a wide range of food items – whether they’re plants or animals. Best known for their mischievous-looking black face mask, raccoons are typically gray in colour and have a tail marked by 5-10 alternating black and brown-coloured rings. Able to live in a wide range of habitats, raccoons can become an unwanted nuisance in city areas when they decide to make your home theirs. 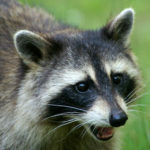 We’re often asked to remove raccoons from chimneys, garages, attics or underneath decks. Ensure trees and overhanging branches are kept at least two feet away from your home. Otherwise, these make easy access points for raccoons. Remove any unused TV antennas. Sometimes you may find muddy footprints on your downspout, which may indicate this is the route they’ve chosen to gain access. We can install a weather-resistant stainless steel deterrent called nixilite. If raccoons have already gained access into your home, a trapping program can be set up to remove all animals and then the hole can be repaired by us, you or a qualified roofer to prevent future access. Call our office for assistance! 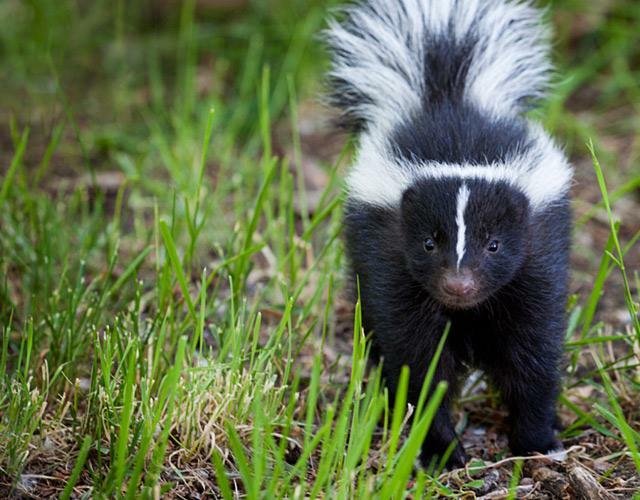 Skunks are omnivorous, eating both animal and plant material with insect larvae providing the bulk of their diet. This can be somewhat problematic, as their digging holes in search of more insect larvae can make them most unwelcome in your yard. 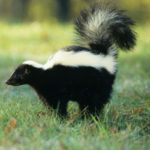 Skunks have become accustomed to humans and can often be found thriving in semi-open agricultural areas, mixed woods, meadows and even some urban areas. When cold weather hits, skunks often seek out dens so they can hibernate for the winter. Any dark, secure area will do as a good den or hiding place for a skunk, including underneath barns, utility sheds and porches. Skunk mating typically occurs in late February or early March. In late April or May, skunk offspring are born with five kits on average. A trapping program to have these animals relocated is usually our recommended method of removal. Call our office for assistance – we would be happy to put our successful trapping experience to work for you! Predominantly herbivorous, squirrels tend to eat seeds and nuts, although many of them will also consume insects and small vertebrates. Included in the rodent family along with chipmunks and woodchucks, squirrels typically have slender bodies with bushy tails and large eyes. The common eastern gray squirrel is one of few mammalian species that can descend a tree head-first. It does this by turning its feet so the claws of its hind paws are backward-pointing and can grip the tree bark. Squirrels typically breed once or twice per year, and after 3-6 weeks, give birth to a varying number of young that is dependent upon their species. Squirrels typically enter your home due to their ability to chew through or push up areas of roof overhang. The most effective method of removal is a trapping program to have these animals relocated. Call our office for assistance – we would be happy to put our successful trapping experience to work for you! Once the animals have been removed, the hole can be repaired by us, you or a qualified roofer.